Does that sound familiar? I am sure it does! Not surprisingly, many of us have either turned down invitations for religious or related ceremonies or have had our relatives, friends and acquaintances do just that because of our monthly menstrual cycles. I was born in India and I also thought on similar lines – I used to avoid going to temples during this phase of the month. I don’t remember my mother ever explicitly asking us to follow this norm but I was well aware of it, perhaps I had learnt of this from my friends or may have overheard someone talk about this inside or outside of the family. It seemed to be a norm, something that was accepted and adhered to. I am (generally) not a rebel and I usually choose my battles wisely. Having said that, the restrictions surrounding menstruation did not pose as a threat to my freedom, nor did it affect me emotionally. I don’t remember thinking in those terms at that age any way. However, I do recall one instance where I couldn’t go to a jagrata in the neighborhood, an all night long Hindu ritual which is celebrated in honour of Maa Durga.All my friends went for it but I missed out on the tasty prasaad. I am sure I must have asked the question: “Why could I not go?” but I do not remember the response I received. My trips to the temple were, in some way or another influenced by these ‘dates.’ However,this had little or no impact on me as such. Years went by and the custom continued, until the ‘D-day’ arrived;yes, my wedding day. I had this beautiful lehenga that I was waiting to get into, all nervous but excited and amidst these feelings, my period unexpectedly decided to pay me a visit! Traditionally speaking, menstruation is seen as a form of impurity (Rierdan and Rise, 1995). It is considered a culturally sensitive subject and not generally spoken about in public. Procter & Gamble’s ‘Whisper’and Ipso, conducted a survey among 1,105 women and 202 men across 10 cities in India in 2014. It was reported that 75% women purchased pads in a brown bag or newspaper and of course we all know why! Women find it embarrassing to talk about their period due to its associated shame, forget about carrying sanitary napkins in transparent bags. Let me tell you this, this survey was conducted among urban men and women, so it is you and me and not just women in villages or slums (as one may like to think) that hold such views about menstruation. 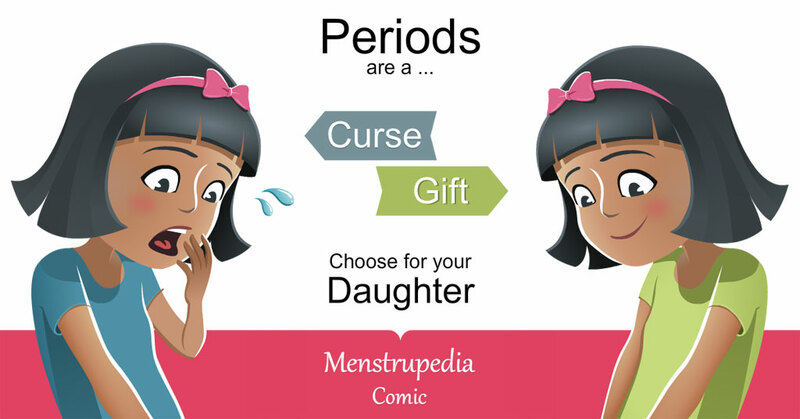 Strangely, on one hand, menarche which is the onset of menstruation is often defined as the readiness of a girl for marriage and is considered to be a cause for celebration. On the other hand,we consider periods to be unclean. In our culture, where childbirth gives one a chance to celebrate the creation of life and which is for a woman, her biggest rites of passage, we consider the reproductive cycle, which prepares a woman’s body for pregnancy each month, to be unholy. So coming back to me and my own experience. In Indian tradition, marriage is a religious ceremony – so would I have refrained from getting married that day? For me, menstrual cycles area natural biological process and I let it flow through its natural course. I understand that they may be painful and/or uncomfortable, but it is certainly not sinful. People who mattered to me were aware of this and isn’t it all that matters after all? Anyhow, being a social researcher focusing on the reproductive health of women, how could I have let a natural occurrence dull the sparkle of my wedding? Having said that, I do appreciate and respect other people’s sentiments and if I am ever invited for a religious ceremony, I do let the hosts know ifI am on my period and I try and understand their preference of whether I attend their ceremony or not or how I should attend it. 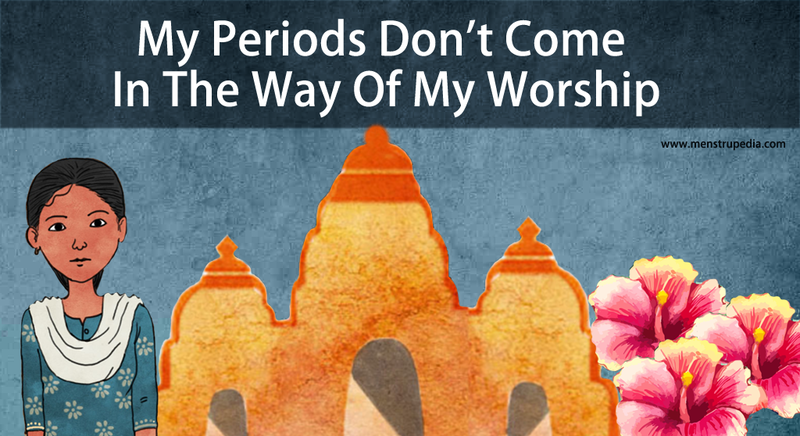 I have never let my periods come in the way of worship. I don’t believe in treating a menstruating woman as dirty or impure. God is the same for all of us, for rich or poor, for men or women, whether we are bleeding or not. I think it is time we spoke openly about menstruation in order to help us all break through the bondages of myths and taboos. Media is very powerful and in a country like India, it can do wonders in creating positive change in society. I am curious to see how the upcoming Bollywood movie #Padman will be received by the Indian audience and if it will be able to create a stir and whether or not it will be a step in the right direction in starting a dialogue about this very taboo topic. Well, I certainly hope so! P.S. : This blog attempts to put forward some of the learning and thoughts that have arisen from my doctoral research in addition to my first-hand experiences.